So maybe this isn’t as glamorous as Leonardo DiCaprio wearing an Auburn hat or as hip as Dr. Dre wearing an Auburn hat (or shirt), but an AU pop culture reference is an AU pop culture reference. My wife’s family has roots in Bayou la Batre, Alabama, so on Thanksgiving night I sat down with my in-laws and watched The History Channel’s latest extreme job-related, boy-don’t-these-folks-talk-funny reality show, “Big Shrimpin’.” If you’re unfamiliar with the show, it follows the lives of the crews of three Bayou shrimp boats as they search for “brown gold” out in the gulf. Bayou la Batre is your typical small Alabama town in that most of the residents tend to waste their allegiance on the school that shall not be named, so I fully expected to see plenty of crimson. Much to my surprise, I was wrong. The only gear of either school (at least on the one episode I’ve watched) was the hat above. 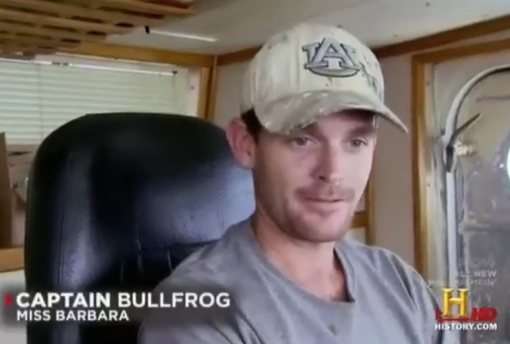 That’s Captain Bullfrog of the Miss Barbara, one of the three boats featured on the show. At 32, he’s the youngest captain on “Big Shrimpin'” and he’s eager to prove that he can run with the big boys. He’s the right age, so maybe he’s a friend of former Auburn fullback/linebacker/nightmare fuel source and Bayou la Batre native Brandon Johnson. David Small started school at Auburn just in time to witness one of the best possible seasons to be an Auburn student (1993) and finished just in time to miss one of the worst (1998). A Gulf Coast native and third generation Auburn man, he’s currently lives in Atlanta, raising the fourth generation. Related: Auburn electrical engineering grad stars in new National Geographic reality series.